I promised you a quilt post today — but even better — it’s a FINISH post! 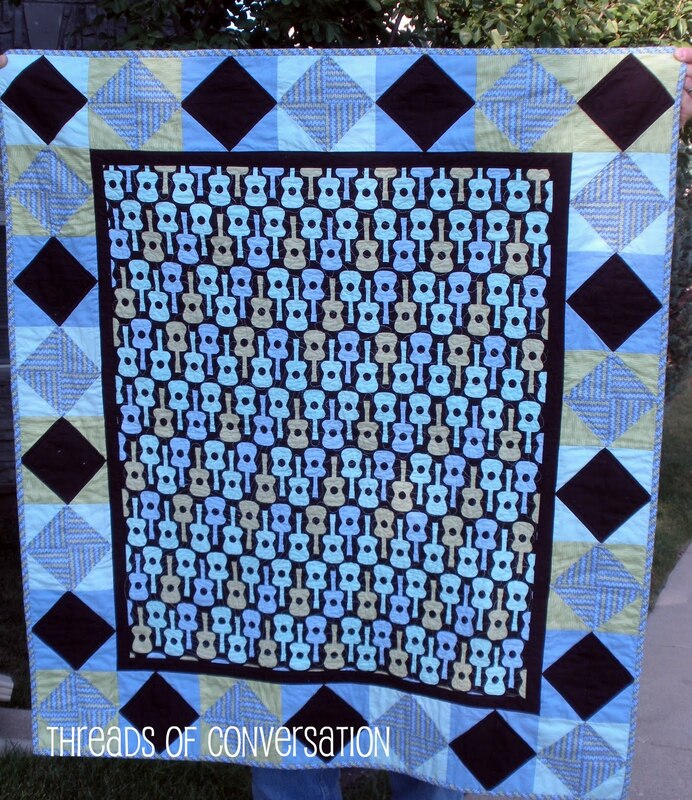 I started this baby quilt in September 2010 (intended for baby Noah, who was then 2 months old) at a retreat. When I unpacked after retreat, I put it neatly in a crate in my quilt studio until I could work on it again. 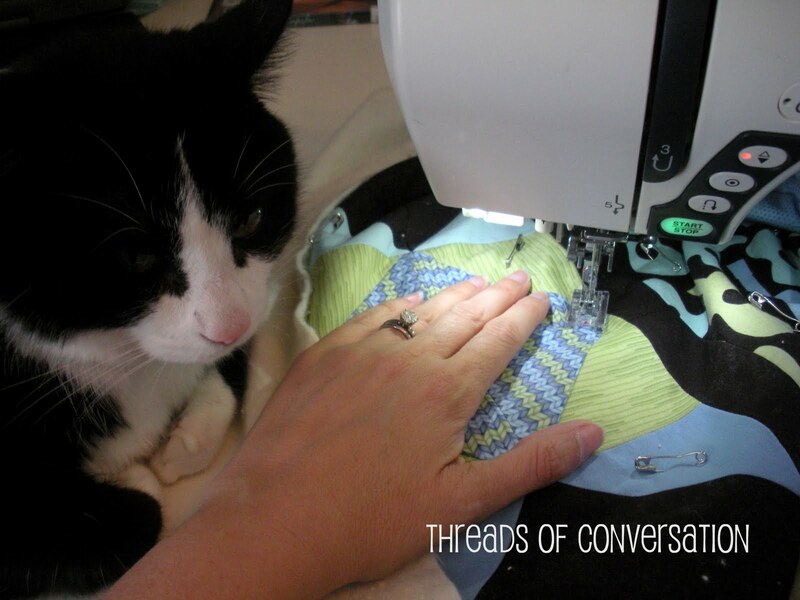 I went to work on it about three weeks later… and could not find the fabric or blocks I had started–anywhere!! It remained lost for several months until one day I was looking for a particular stabilizer for a bag project, I pulled some out of a crate in my quilt studio, and lo! and behold! The entire project was right where I left it. This has to be one of my favorite quilts. Ever. Love the quilt, love the cats!!! 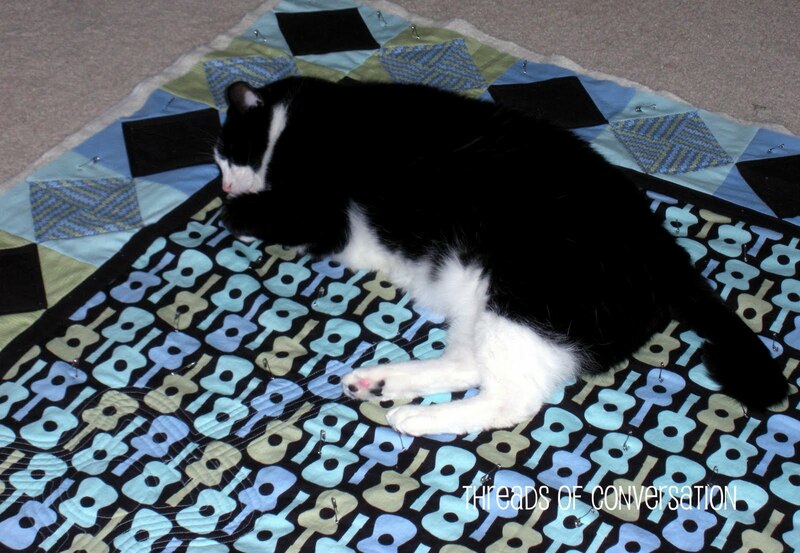 Your quilt turned out awesome…I can see why it is your favorite. 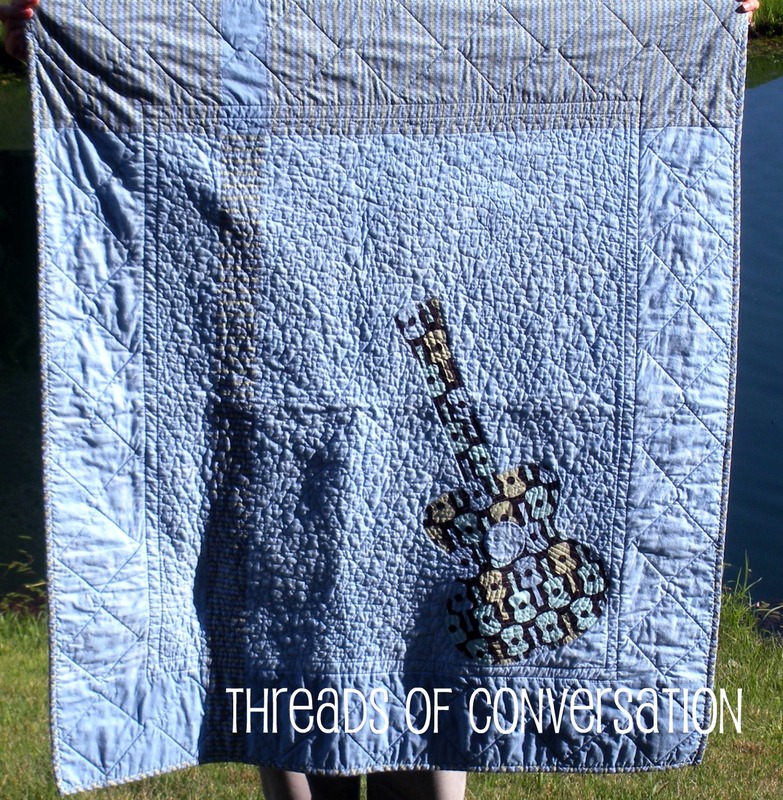 I love how chose to quilt it, especially around the guitar on back. That is so cool! Love the back! Two quilts in one! This is a nice themed quilt with good design and fabric selections. That guitar is so cool, Noah will love this one for a long time (as will the mom and dad!). I like the hole being your label, too. I have many times added extra width to the side like you've done, the quilt hums modern, Doris! Great job! 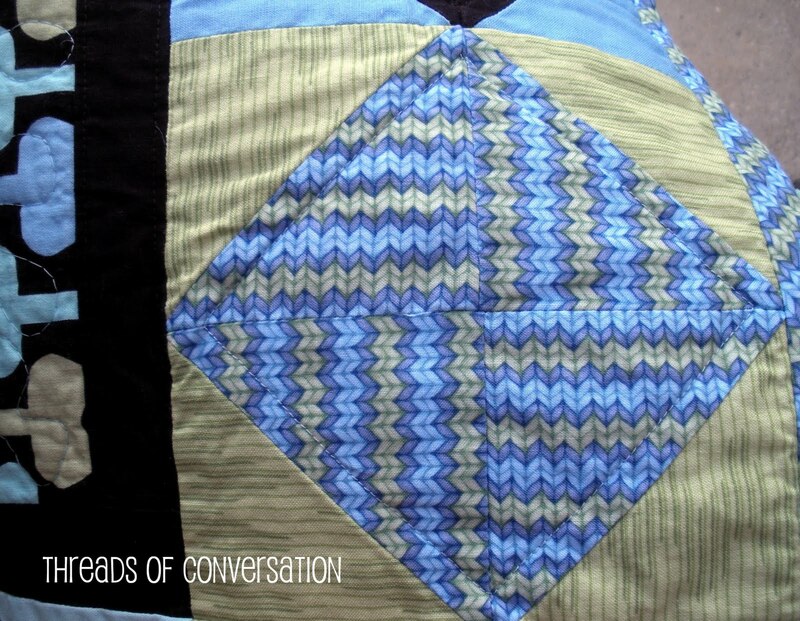 That is a fun, reversible quilt! And I love the sneaky look on the cow kitty's face when he's pretend sleeping (that's what hubby & I call B&W cats, they remind us of dairy cows; yah, we're a bit strange! 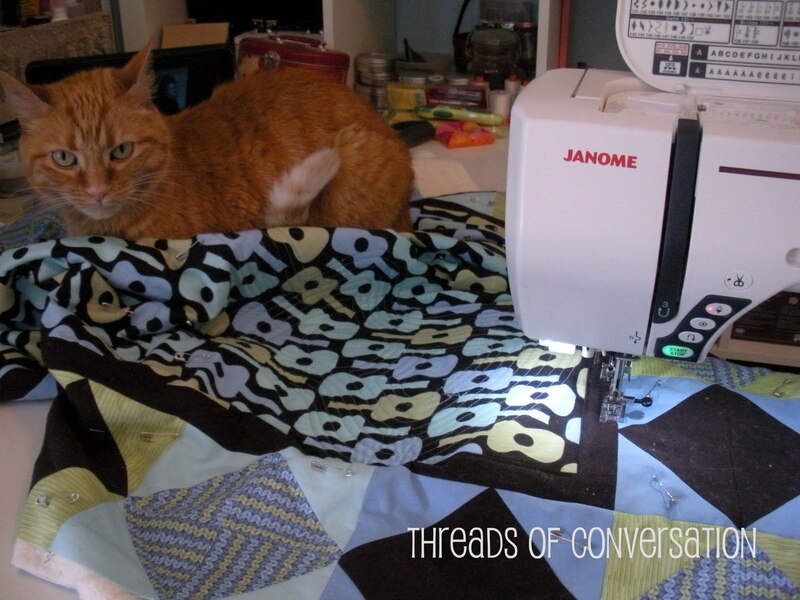 )… Both of our cats gave the seal of approval on the quilt I was binding on Sunday – I just figure if a cat doesn't like a quilt, I have a MAJOR problem! This turned out so cool! 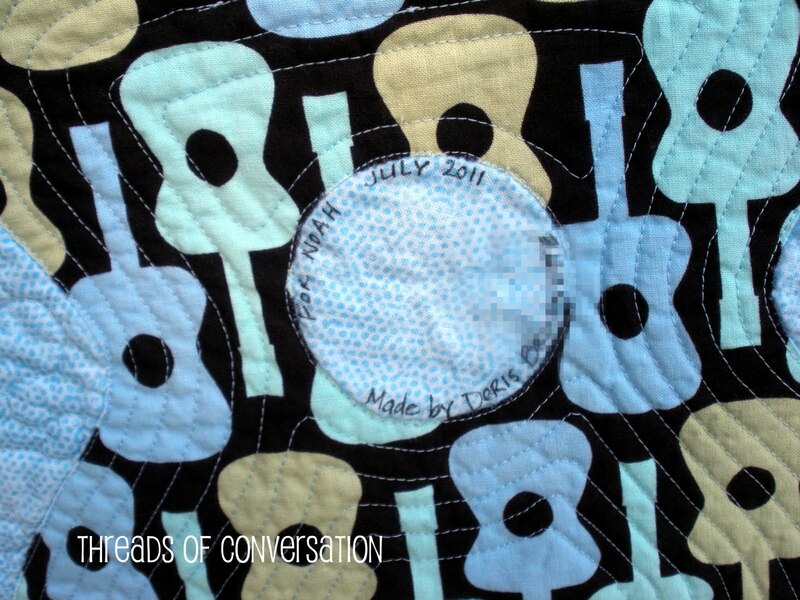 I love the quilting you did to outline the guitar on the back, and the borders. And the stippling really finishes it off nicely. 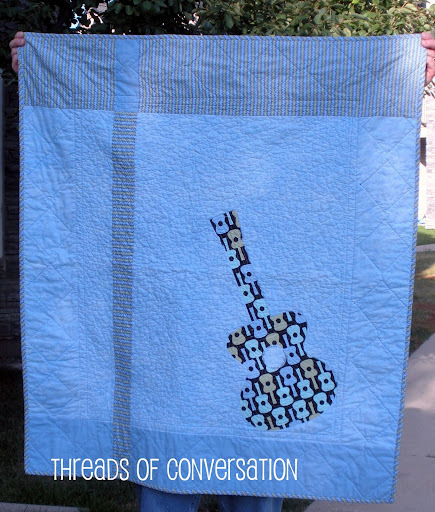 Such a great way to showcase that guitar print – well done! Oh, Doris! It turned out so great! I just love the quilting you did. And what a clever solution to the label. Just fantastic! I think it's about my favorite quilt, too. I really love how you did the back with that stripe. I think that adds so much interest! Loved your cats, too. What a riot. Well done! It was so fun to see the progress on this quilt in person. It is absolutely awesome! The guitar is so cool! Awesome finish! 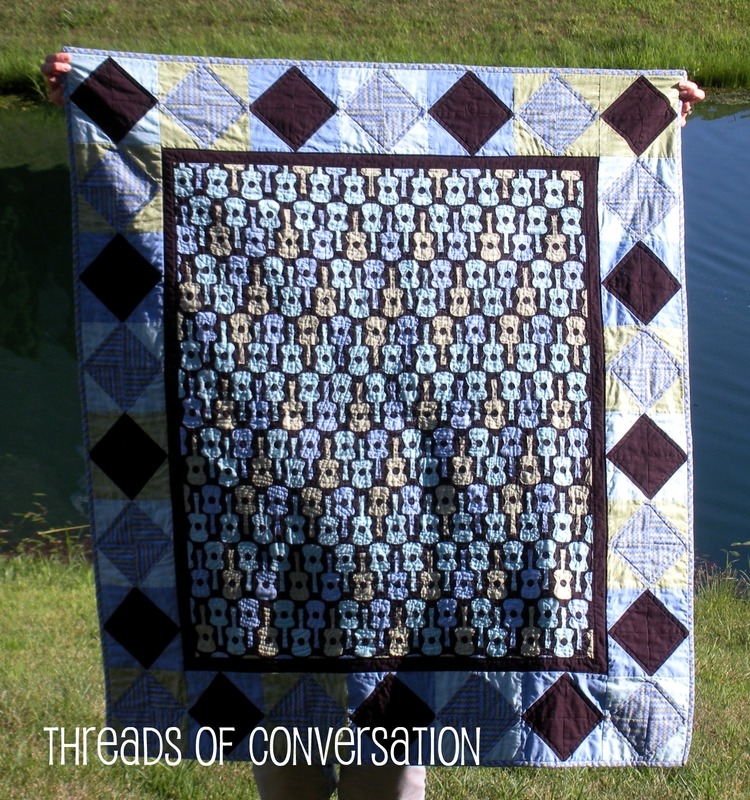 What a fun quilt, this is a great REVERSIBLE quilt!! Oh, I love this so much! Can I just tell you how long I looked at that fabric for my son's quilt, but couldn't figure out just what I wanted to do with it? You are so clever! What a gift for this musical family. I'm sure they will treasure it always. Awesome quilt! Very unique and special, everything about it is so cool. Great present and I'm sure it will be treasured. The squares on point are awesome and the guitar—rockin' it!! Super duper cool quilt!!! Congrats on a great finish! Doris, this is the coolest quilt!!! 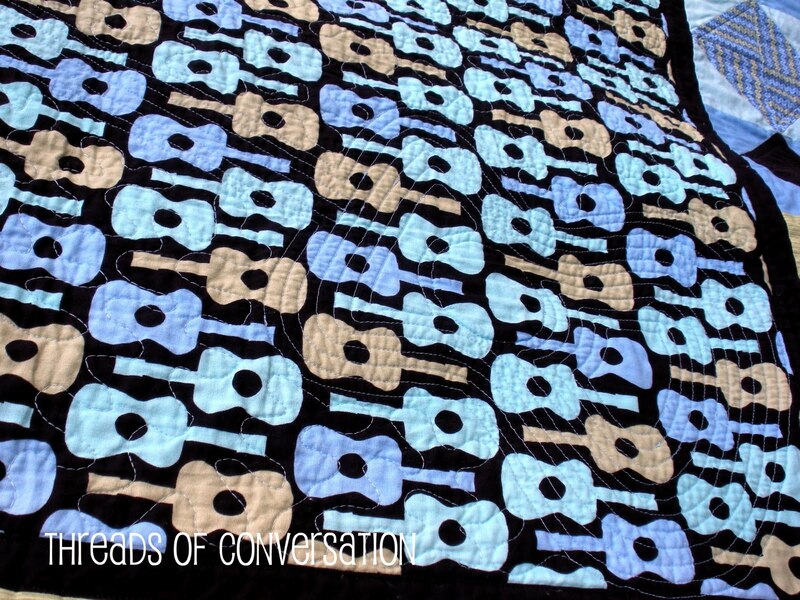 Love that guitar fabric and the way you pieced the back! Great label idea too. Noah is one lucky dude! 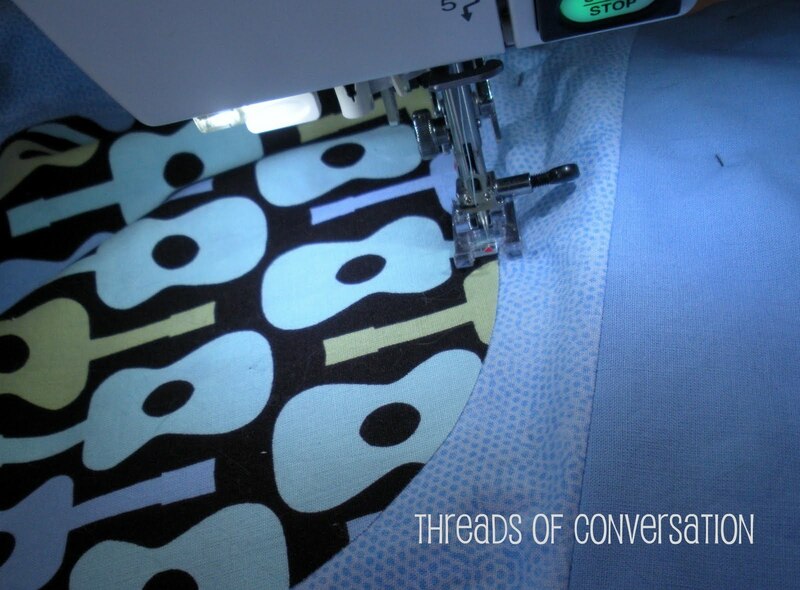 Fun quilt – love the back too! Doris, it came out great! I love it! this quilt ROCKS! (lol! i crack myself up!) really, doris, i can see why it is one of your favorite quilts ever. it's just stunning. you did a great job finishing it, too. i'm geeked that i got to see you working on it in person. So well done, Doris! That inserted strip, in the backing, worked perfectly, didn't it? It looks like it belongs there. 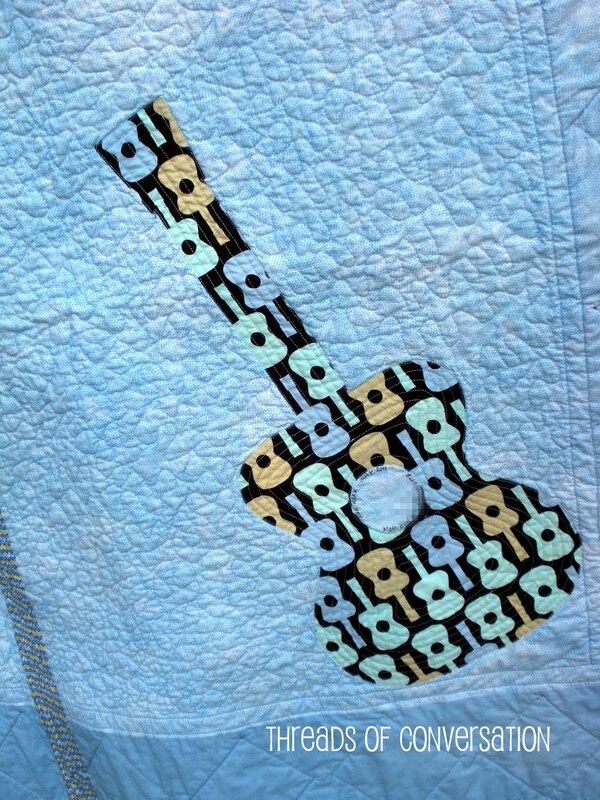 Your quilting is great, and it's smart to make the guitar opening your label. You are just too clever!